석가가 설법하는 장면을 그린 영산회괘불인데, 괘불이란 절에서 큰 법회나 의식을 행하기 위해 법당 앞 뜰에 걸어놓고 예배를 드리는 대형 불교그림이다. 길이 10.75m, 폭 7.2m 크기의 이 영산회상도는 석가불을 중심으로 오른쪽에 다보여래, 문수, 보현보살이 있고, 왼쪽에는 아미타불, 관음, 대세지보살이 서 있다. 화면을 가득 채운 석가모니는 화면 중앙에 서 있는데 이목구비는 큼직큼직하며 건장하고 각진어깨, 노출된 가슴, 유난히 길게 늘어진 팔, 짧아 보이는 하체를 지녔으며 이렇게 크고 건장한 신체는 보는 이를 압도하는 듯하다. 인다. 녹색과 주황색을 주로 사용하였고 회색, 분홍 등 중간색을 넣어 은은한 분위기를 나타내며 구름, 연꽃, 단청문양 등으로 화려하고 환상적인 느낌을 연출하고 있다. 의겸 등 여러 승려 화가들이 그린 이 그림은 본존불을 강조하여 시선을 집중시키는 효과를 의도적으로 나타내고 있다. 조선 정조 16년(1792), 순조 9년(1809)에 뒷벽을 새단장한 기록이 있어 승려화가인 의겸이 활약한 영조 6년(1730)경에 만들어진 것으로 보인다. This type of large-sized painting used to be hung in the front courtyard of a temple hall at an open-air sermon session or ritual. 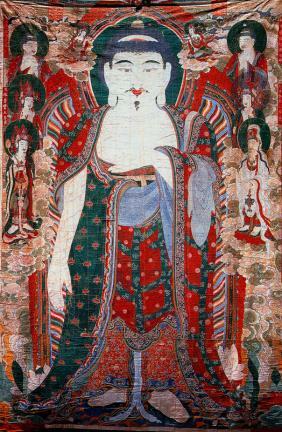 Measuring 10.75m (L) by 7.2m (W), this piece displays Shakyamuni Buddha at the center flanked by Prabhutaratna Buddha, Manjusri Bodhisattva, Samantadhadra Bodhisattva on the right, and Amitabha Buddha, Avalokitesvara, and Mahasthamaprapta Bodhisattva on the left. 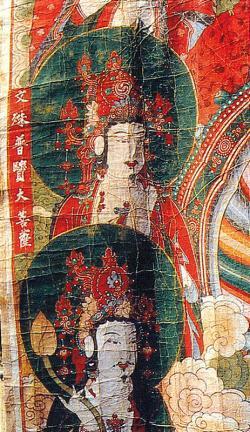 Shakyamuni Buddha has large eyes, ears, mouth, and nose, in addition to the square and wide shoulders, a bare chest, an unusually long arm, and the disproportionately short lower part of the body. His robust-looking body dominates the canvas. Green and orange colors are used a lot, with secondary colors like grey and pink creating a hazy, subdued atmosphere. Cloud, lotus, and dancheong patterns add to the gorgeous, dreamlike atmosphere. 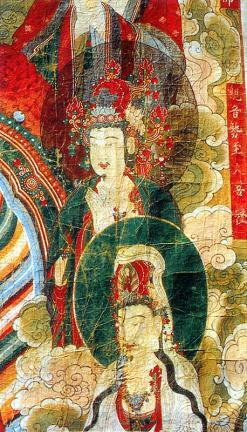 The piece, which was made by several monk painters including Uigyeom in or about 1730 (the 6th year of King Yeongjo’s reign), appears to draw attention to the Buddha at the center. According to the relevant records, the rear wall of the painting was refurbished in 1792 (the 16th year of King Jeongjo’s reign) and in 1809 (the 9th year of King Sunjo’s reign).